The present US education system does very little to prepare the students for the real world. 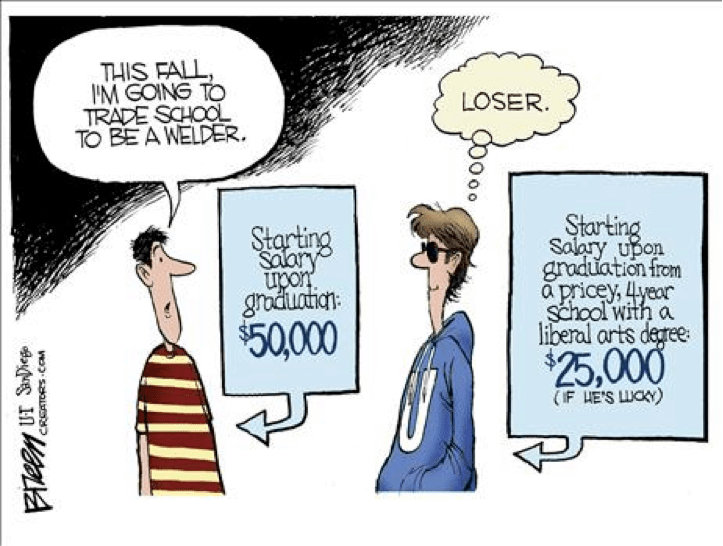 At the end of 12th grade very few have any true skills to get a job. Plus many college degrees are useless as they are too general and the first two-years are usually a repeat of high school. Many students cannot get jobs that justify the cost of college. I think the following would go along way to fix the system. First thru sixth grade the teachers must teach the students the BASICS like arithmetic, speaking, spelling, reading and writing. Teach arithmetic without calculators. Teach the student what type questions to ask themselves to reason out the answers for themselves. Teach US history with solid knowledge of the Constitution and Bill of Rights, plus world history and geography are a must. Starting in 7th grade the courses change to three hours a day for courses to prepare the student for college. One hour a day for a course called LIFE. This course would teach the student EVERYTHING they need to know once they begin life after 12th grade. Like cooking, washing the clothes, balance the checkbook, understanding the interest rates on loans, how to do a budget and stick to it, etc. Then four hours of vocation/trade skills. These courses would teach skills to be a plumber, carpenter, chef, landscaper, auto mechanic, dental tech, nursing, etc. The courses would also include management, purchasing, accounting and all of the skills needed to run a business. At the end of the courses the instructors would or would not issue a certificate that guarantees the employer that the student can do the job without supervision and correctly. The student could in many cases finish school with three to six skills. I am pretty sure the drop out rate would be much lower then it is now. And the students would be more prepared to start life on their own. ***I agree with your fix; students do need hands-on classes. It is much more interesting to study practical, useful skills. This is what builds self-esteem, not empty praise. To read a 1912 Eighth Grade Examination for Bullitt County Schools, KY click here. Click here to read the answers. Click here to read: Newly Discovered Eighth Grade Exam From 1912 Shows How Dumbed Down America Has Become. Just, maybe we should go back about hundred years or so and use the curriculum from than and maybe the methods teachers use then too. Click here to watch: Stossel 05/29/2015: The college scam. Click here to read: Cost of Public Education: Good Return on the Investment? Click here to read: Does Spending More on Education Improve Academic Achievement? Click here to read: Throwing Money At Education Isn’t Working. 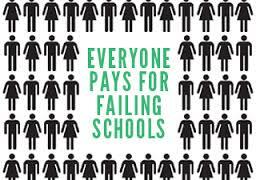 Click here for: We Will Not Conform Action Plan – a comprehensive document that helps teach you how to push back against Common Core standards in your neighborhood, in your community, and in your state! Click here for: Stop Common Core NC. Click here for: Fight Common Core. 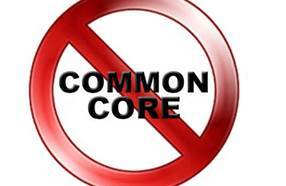 Click here for: The Common Core: A Bad Choice for America. Click here for: The Battle Against Common Core Standards. As Common Core Becomes Punchline, Critics Win Battles Nationwide The New American – Parents nationwide are now refusing to let their children participate, preferring instead to “opt out” of the federally funded Common Core national testing regime that underpins the entire nationalization bid. At least 15 state governments so far, under immense public pressure, have already taken a step back. And analysts say this is likely just the beginning of the fight, with the tsunami of opposition threatening to end the political careers of Common Core defenders across the nation. Click here to read article. Terrence O. Moore is an assistant professor of history at Hillsdale College. He received his Ph.D. from the University of Edinburgh and served as the founding principal of a top K-12 classical school, Ridgeview Classical Schools, in Colorado. He advises Hillsdale’s Charter School Initiative, providing assistance with the formation of classical charter schools across the country. Dr. Moore is the author of The Perfect Game and The Story-Killers: A Common Sense Case Against the Common Core. Click here to read: Lt. Gov. Dan Forest’s letter to Superintendent of the Department of Public Instruction. Click here to read: DPI’s Response to Lt. Gov. Forest’s 67 Questions about Common Core. Click here to read and view video of: This Could Be One of the Best Cases Ever Made Against Common Core – No One Expected It to Come From a High School Student. Click here to read: Common Core Standards Will Impose an Unproven ‘One Size Fits All’ Curriculum on North Carolina. Click hereto read: An Engineer Looks at the Common Core Mathematics Standards. Click here to read: Common Core: What Can We Do? Click here to read: The Common Core is Rotten – Here’s Why Click here to read: Common Core: Worse than you Think. Click here to read: DPI Defense of Common Core Is Mystifying – Part I” Click here to read: Common Core Demystified, Part II. Click here to read: Common Core Curriculum: A Look Behind the Curtain of Hidden Language. 1963 Communist Goal 31: Belittle all forms of American culture and discourage the teaching of American history on the ground that it was only a minor part of “the big picture”: Give more emphasis to Russian history since the Communists took over. 1963 Communist Goal 32: Support any socialist movement to give centralized control over any part of the culture – education, social agencies, welfare programs, mental health clinics, etc. 1963 Communist Goal 28: Eliminate prayer or any phase of religious expression in the schools on the grounds that it violates the principle of “separation of church and state.” 1963 Communist Goal 19: Use student riots to foment public protests against programs or organizations which are under Communist attack. 1963 Communist Goal 18: Gain control of all student newspapers. 1963 Communist Goal 17: Get control of the schools. Use them as transmission belts for Socialism, and current Communist propaganda. Soften the curriculum. Get control of teachers associations. Put the party line in text books. Click here to read: Common Core Is Meant To Destroy and Replace Public School Education. Attendee at Conejo Valley Common Core Meeting is Shocked- Wait ’til you read his email. Click here to read article. Article include sources to watch and read about Common Core. (Video) Common Core: Dangers and Threats to American Liberty. Click here to read and watch video. Click here to read: Top Ten Professors Calling Out Common Core’s So-called College Readiness. Click here to visit: Stop Common Core NC. Click here to read: Common Core assignment makes sixth-graders SCRAP Bill of Rights amendments. Click here to read: The Federal Takeover of Catholic Education. Click here to read and watch: Mike Rowe on How Many Are Following the ‘Worst Advice in the History of the World’. Click here to read: All Common Core Critics Aren’t Extreme. Click here to read: What is Common Core. Click here to take the: Common Core Quiz. Click here to read: Expert Highlights Dangers in Common Core Standards. Click here to read: Common Core Mess: Standards Are Badly Flawed. 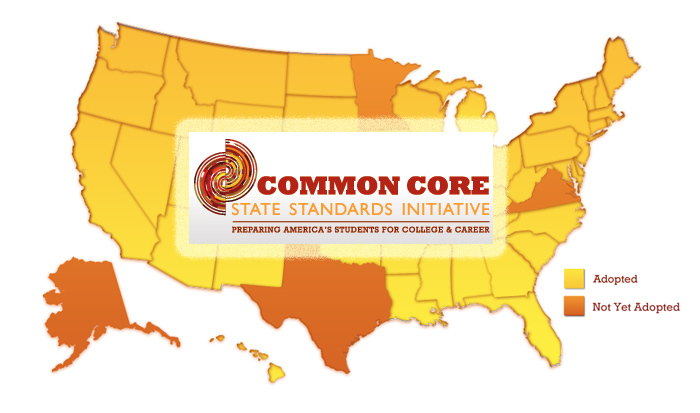 Click here to read: Implementing The Common Core State Standards. Click here for: NC Public Schools website page for Common Core. Click here for the Blaze page on Common Core. Click here to read: Common Core English Language Arts Standards: More Problems than Promise. WRAL.COM – As schools around the U.S. implement national Common Core learning standards, parents trying to help their kids with math homework say that adding, subtracting, multiplying and dividing has become as complicated as calculus. Click here to read article. 4 LA Kids News – Unable to Find Skilled Workers, Southwire Creates Training Program for High Schoolers. Breonna Daniel, a onetime high-school dropout, was smoking pot and “hanging out with the wrong crowd” last year without a hint of concern for her future. This summer, she is among hundreds of teens working on Southwire Co.’s factory line four hours a day, earning above minimum wage and spending eight hours a day in the company’s classrooms. It is part of a novel program designed by the cable manufacturer to develop a skilled workforce and get troubled high-school students from the community back on track.